I lead the Bar Hill, Cambridgeshire DUP group [www.lovehealth.org/dances/index.htm] in Cambridgeshire. DUP dances also figure regularly in my Stress, Wellbeing & Shamanism workshops. I have also led dances at DUP Camps, DUP Network meetings and other events around the country. I came into DUP via a mystical connection to Ralph Nimmann in Cambridge in 1999. In 2007 I joined the 2-year dance leader training course led by Tansen [Philip O’Donohoe] who has continued to be my mentor since then. I have trained for extended periods and and still practise in Buddhism, Christianity, Paganism, Sufism, Taoism and the international esoteric spiritual group “Subud”. 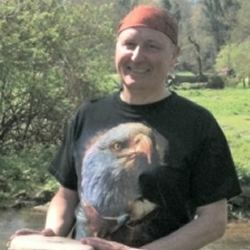 Via Subud I connected to a “Medieval Monk” alter ego which led me into charity work for the Cambridge Leper Chapel and setting up a spiritual healing website: www.brothermichael.org.uk. In 1997 I had a “visionary calling” to the Shamanic Path and since 2004 have led workshops and courses in shamanism and shamanic healing. In recent years I have facilitated workshops in Healing, Shamanic Journeying, Soul Retrieval and Rebirthing at the “Sacred Arts” and “Peace Through the Arts” DUP camps. I live in rural Cambridgeshire [and N. Wales for part of the year] and work as a stress-management coach, meditation and mindfulness teacher and as a holistic healer. I run [and co-founded] the Cambridge Healing & Holistic Lifestyle Group and the “UK Shamanism Today” group on Facebook..
Michael is a Mentored Leader.